Morgan Rosenberg holds a graduate degree in physics and is the author of two previous books, Dark Buddhism: Integrating Zen Buddhism and Objectivism and The Essentials of Patent Claim Drafting. Rosenberg wrote If You Can Breathe, You Can Meditate as a concise, stand-alone guide to a multitude of meditation techniques, from following the breath to eating mindfully (a highly effective diet strategy, too, he notes). At less than one-hundred pages, the book focuses on the many healthful—rather than esoteric—benefits to establishing a regular meditation practice. Rosenberg endeavors to avoid any connection to new age philosophy or established religions of any kind. He does make exceptions for Buddhism and Patanjali’s Yoga Sutras, which, one could argue, are as new age as chakras and acupuncture, two things he condemns. This surprising tendency toward blanket generalizations that hint of an illogical bias is one of the book’s few flaws. For the most part, If You Can Breathe, You Can Meditate is an open-minded, accessible, and easy-to-read volume that fills an underserved niche by focusing on meditation for a secular audience. The attractive front cover sports a photograph of a pair of lotus flowers floating in a mottled blue pond. Unfortunately, the black font on the back cover is difficult to read, and the spine is entirely blank. Rosenberg writes very well, and the book has almost no typographical or grammatical errors. His style is personal and anecdotal, with many empathy-building references to his own struggles with developing a workable meditation practice. The text is organized into fifteen short chapters and includes an excellent bibliography of books that Rosenberg recommends for further reading. 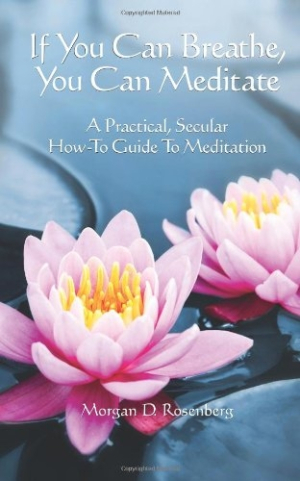 The first few chapters are packed with an abundance of very useful and easy-to-understand tools for commencing a meditation practice. Rosenberg breaks meditation down into steps and encourages practitioners to work their way up from five minutes. He advises readers to experiment with several different styles until they find one that resonates with them. Chapters eleven, twelve, and thirteen are about letting go of attachments, Zen koans, and meditation in the real world, respectively, and they are superb. On the other hand, a chapter of frequently asked questions is a bit silly and patronizing. And the final chapter is odd, wherein Rosenberg recounts his visit to a Zen temple in Japan and suggests that being whacked with a stick is not helpful to a meditation practice. Fortunately, the rest of the book is so good, these minor issues are easily forgiven.